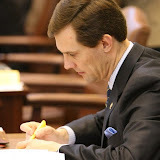 On October 19, 2011 House Speaker Kris Steele named a bipartisan group of representatives to engage in a strategic review of DHS and to make recommendations on restructuring the agency for consideration during the 2012 legislative session. Since then, the goal of the working group has been to improve DHS through significant study and recommendations of potential reforms to the governance structure, agency structure, personnel policy and resource allocation. The plan is in response to a shared desire between House members, agency officials and other stakeholders to improve delivery of services by DHS, particularly for children in state custody. 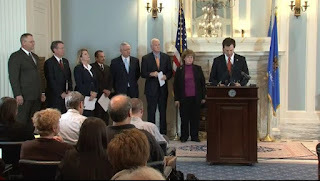 Leading the group has been Rep. Jason Nelson, R-Oklahoma City. Other members of the group are Reps. Pam Peterson, R-Tulsa, Pat Ownbey, R-Ardmore, and Wade Rousselot, D-Okay. The group operates in a unique manner, with much of its work occurring in small meetings with DHS workers in the field, where the group observes how policies are implemented and analyzes organizational strengths and needs. The group also meets with other agency officials and leaders, DHS commissioners and many other stakeholders. The group’s meetings with workers have been private to allow for candid conversations and disclosure of sensitive information. The group is also engaged in an in-depth study of the agency’s structure and resource allocation to determine if better results could be achieved through reorganization and reprioritizing resources. The group is currently working to produce a public report in addition to the legislation passed during the 2012 Legislative Session.